An anaesthesiologist must assess the patient preoperatively and devise an appropriate plan of anaesthesia to have a safe outcome. Preoperative assessment of airway can reduce the incidence of difficult laryngoscopy and intubation., The diagnostic accuracy of bedside screening tests has varied from study to study probably because of differences in the incidence of difficult laryngoscopy, inadequate statistical power, different test thresholds and the difference in patient characteristics. Obesity is a growing problem globally and anaesthesiologists frequently encounter such patients whose airway management is their main responsibility. In the Asian population, obesity-related diseases are associated with much lower body mass index (BMI) than their Caucasian counterparts. Hence, the Health Ministry of India redefined overweight and obesity as BMI ≥23 kg/m2 and ≥25 kg/m2, respectively. The majority of studies of difficult laryngoscopy and intubation have been performed in the Western population. Anthropometrically, Indians are different compared to the Americans or Europeans. After obtaining the Institutional Ethics Committee approval with waiver of consent, 200 patients belonging to the age group of 18–70 years scheduled for planned surgery under general anaesthesia and requiring endotracheal intubation were considered in this prospective study. Patients with upper airway pathology, neck mass, cervical spine injury and pregnant women were excluded from the study. All patients underwent preanaesthetic assessment by one investigator to avoid interobserver variation. During preanaesthetic check-up, modified Mallampati score (in the sitting position), neck movements, upper lip bite test, thyromental distance, sternomental distance, interincisor gap (IIG), neck circumference and the ratio of height-to-thyromental distance was obtained. Patient's height in standing position (cm) and weight (kg) were measured and BMI was calculated. Difficult airway cart was kept ready for all cases before induction. All patients were given tablet alprazolam 0.25 mg (for <50 kg) and 0.5 mg (for >50 kg) on the night before surgery. All patients received injection ondansetron 0.15 mg/kg on the day of surgery (45 min prior). In the operation theatre, standard monitors (5-electrode electrocardiogram monitoring Lead II, noninvasive blood pressure, pulse oximeter, capnography and peripheral nerve stimulator) were established. The patient was preoxygenated for 3 min with 100% oxygen through bag and mask, following which anaesthesia was induced with midazolam 0.02 mg/kg, fentanyl 2 μg/kg and propofol 2 mg/kg. Succinylcholine 2 mg/kg or vecuronium 0.1 mg/kg was administered once the ability to ventilate was confirmed using bag and mask. Patient was positioned in sniffing position; laryngoscopy and intubation were performed after complete muscle relaxation (no twitches on the ulnar nerve stimulation confirmed using the train-of-four mode on a peripheral nerve stimulator). Endotracheal intubation was carried out by an anaesthesia provider who had performed a minimum of 100 successful intubations and who was unaware of the airway measurements of the patients. Macintosh blade #3 for females and #4 for males was used to perform laryngoscopy. The Cormack–Lehane grading was noted by the anaesthesia personnel who performed the intubation. View obtained at first laryngoscopy was noted for Cormack–Lehane grading. 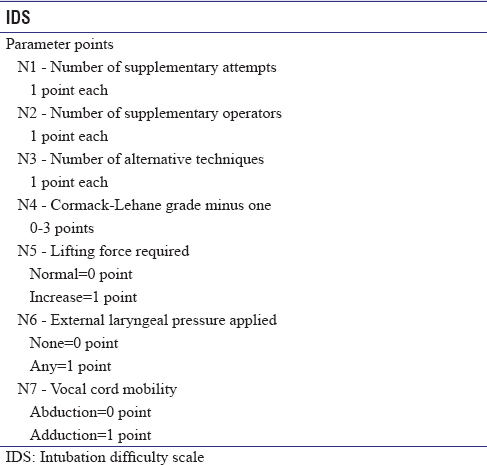 The whole intubation process was scored by using seven measurable variables as outlined by the Intubation Difficulty Scale (IDS) [Table 1]. The IDS is a scoring system for evaluating intubation difficulty which takes into account both subjective and objective criteria. On the basis of a previous study that reported an 8% incidence of difficult laryngoscopy in the Indian population, calculation of power of study showed that 184 patients will be required to demonstrate significant difference between patients with easy and difficult intubation with use of α = 0.05 and β = 0.20. We included 200 patients to account for any dropouts. Descriptive statistics in the form of mean, standard deviation for interval variables and frequency, and percentage for categorical variables have been performed to depict baseline data. Student t-test and Chi-square tests were used accordingly. All significant and important variables for difficult laryngoscopy and intubation were selected for multivariate logistic regression. Stepwise forward multivariate logistic regression analysis was performed to see important risk factors for difficult laryngoscopy and intubation. A P < 0.05 was considered to be statistically significant. STATA(14), College Station, TX: StataCorp LP software was used for the statistical analysis. The data obtained from 200 patients was analysed. Demographic data of the population is presented in [Table 2]. Univariate analysis was done both with Cormack–Lehane grading and IDS score with variables [Table 3]. Multivariate regression analysis was performed for the following parameters-modified Mallampati score, IIG, neck circumference, upper lip bite test, and ratio of height-to-thyromental distance. Only IIG and neck circumference (NC) were identified as significant predictors of difficult intubation (P < 0.05) [Table 4]. The incidence of difficult laryngoscopy was 15.5% and difficult intubation was 12.5% in our study. Out of all the clinical bedside tests used to predict difficult intubation, NC (ROC cutoff value >36 cm) and IIG –3.93 (±0.73) cm are the two tests with highest specificity (97%) which were able to predict difficulty in the study population. However, the sensitivity (16%) of these tests was very poor. Difficult intubation is a common problem that anaesthesiologists can face every day in the operating room. The definition of difficult intubation is not uniform as it involves a complex interaction between patient factors, clinical settings and the skill of anaesthesiologists. Identification of risk factors for difficult intubation is important to distinguish between anticipated and unanticipated difficult airway to take precautions. There are many studies and meta-analysis attempting to determine the best single method or combination of methods for predicting difficult intubation; there is a significant difference between the studies. This variation could be because of the difference in the patient characteristics as most of these studies were conducted in the Western population. There is a significant difference in the anthropometry of Indian versus the Western population that is also translated into the anatomical indices used to predict difficult laryngoscopy. Thus, it is important to analyse whether the same parameters and cutoff values can be applied to the Indian population to predict difficult airway. The traditional conventional laryngoscopy cannot be replaced by recent advances in supraglottic devices, fibreoptic scopes, and videolaryngoscopes. The association between obesity and difficult intubation is a matter of debate. Obesity is a recognised risk for obstructive sleep apnoea, diabetes mellitus and hypertension. Obese patients have fatty tissue around neck and peripharyngeal tissue which varies according to race. When difficulty during intubation was encountered, most of the anaesthesiologists in our study initially applied simple manoeuvres such as laryngeal pressure, additional lifting force or use of the stilette. This strategy follows the guidelines published by the Difficult Airway Society for unanticipated difficult intubation in a nonobstetric adult patient. Univariate analysis in the present study showed age, body mass index, modified Mallampati scale, IIG, NC and upper lip bite test as significant predictors. However, logistic regression identified IIG and NC as important predictors of difficult intubation in our study. NC at the thyroid cartilage is a valuable predictor of difficult laryngoscopy and intubation in both obese and lean patients. 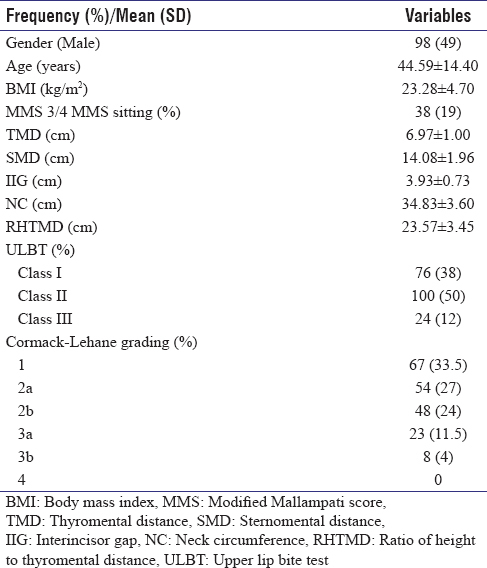 There are studies in the Western population stating increased NC (>40 cm) being associated with difficult laryngoscopy and intubation in obese patients and some studies compared ease of intubation between obese and lean patients.,, However, the cutoff value of BMI for obesity in Indians is different from Western population. 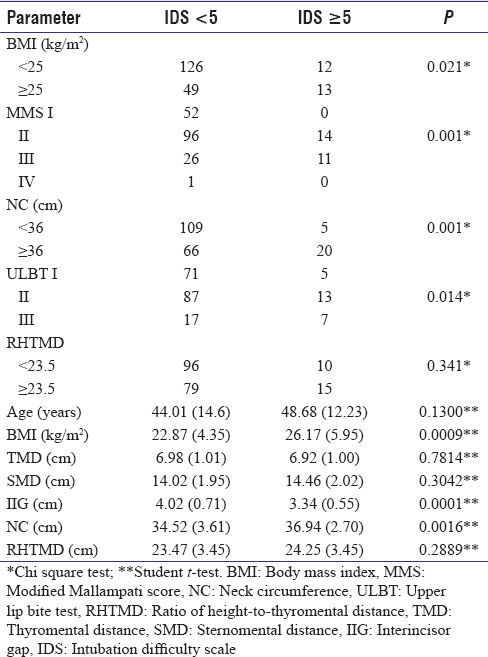 In Indian study with lean patients (BMI <25 kg/m2) and obese patients (BMI ≥25 kg/m2), NC of >35 cm is associated with IDS ≥5, indicating that the Indian population has a fat distribution which is different from the western population. We studied 200 patients belonging to the general population whose mean BMI was 23.28 (±4.70) kg/m2. Our study showed NC >36 cm as a predictor of difficult intubation; on univariate and multivariate analysis (P value on logistic regression <0.0001) [Table 4]. IIG is the distance between the upper and lower incisors, and a distance >3.5 cm is generally not associated with difficult laryngoscopy and difficult intubation. Prakash et al. included 330 adult patients in their study. They stated IIG ≤3.5 cm as a predictor of difficult laryngoscopy. Our study showed IIG as a predictor for difficult intubation (mean value of 3.34 [±0.55] cm, P < 0.0001) on logistic regression. As this was an observational study where many consultants were involved in the conduct of anaesthesia, the choice of muscle relaxant was not standardised. To ensure complete muscle relaxation when vecuronium was used, a peripheral nerve stimulator over the ulnar nerve was used and endotracheal intubation performed after complete abolition of twitches to train-of-four stimulation. In the case of succinylcholine, complete paralysis was assumed after muscle fasciculations faded from toes and fingers. Though complete muscle relaxation was ensured before endotracheal intubation, the fact that the muscle relaxant was not standardised could be considered a weakness of our study. The incidence of difficult laryngoscopy was 15.5% and difficult intubation was 12.5% in our study. Out of all the clinical bedside tests used to predict difficult intubation, NC (ROC cut-off value >36 cm) and IIG 3.93 (±0.73) cm are the two tests with the highest specificity (97%) which can predict difficulty in the study population. The sensitivity (16%) of these tests was very poor. Although there are many clinical bedside tests to predict difficult laryngoscopy and intubation either singly or in combinations with moderate-to-poor sensitivity and specificity, these tests give a brief idea to plan and think for alternative methods of securing the airway optimally using the available resources, causing minimal discomfort to the patients. Knowing the parameters or tests which have comparatively high degree of sensitivity and specificity, which can be rapidly applied in the particular population helps in planning airway management, especially in emergency situations. As an anaesthesiologist, we should “never fail to prepare for failure”! The Royal College of Anaesthetists. The good anaesthetist. In: Standards of Practice for Career Grade Anaesthetists. London: The Royal College of Anaesthetists; 2010. Wilson ME, Spiegelhalter D, Robertson JA, Lesser P. Predicting difficult intubation. Br J Anaesth 1988;61:211-6. Shiga T, Wajima Z, Inoue T, Sakamoto A. Predicting difficult intubation in apparently normal patients: A meta-analysis of bedside screening test performance. Anesthesiology 2005;103:429-37. Adnet F, Borron SW, Racine SX, Clemessy JL, Fournier JL, Plaisance P, et al. The intubation difficulty scale (IDS): Proposal and evaluation of a new score characterizing the complexity of endotracheal intubation. Anesthesiology 1997;87:1290-7. Dhanger S, Gupta SL, Vinayagam S, Bidkar PU, Elakkumanan LB, Badhe AS, et al. Diagnostic accuracy of bedside tests for predicting difficult intubation in Indian population: An observational study. Anesth Essays Res 2016;10:54-8. Prakash S, Kumar A, Bhandari S, Mullick P, Singh R, Gogia AR, et al. Difficult laryngoscopy and intubation in the Indian population: An assessment of anatomical and clinical risk factors. Indian J Anaesth 2013;57:569-75. Gupta D, Rusin K. Videolaryngoscopic endotracheal intubation (GlideScope) of morbidly obese patients in semi-erect position: A comparison with rapid sequence induction in supine position. Middle East J Anaesthesiol 2012;21:843-50. Honarmand A, Safavi M, Yaraghi A, Attari M, Khazaei M, Zamani M, et al. Comparison of five methods in predicting difficult laryngoscopy: Neck circumference, neck circumference to thyromental distance ratio, the ratio of height to thyromental distance, upper lip bite test and Mallampati test. Adv Biomed Res 2015;4:122. Koh W, Kim H, Kim K, Ro YJ, Yang HS. Encountering unexpected difficult airway: Relationship with the intubation difficulty scale. Korean J Anesthesiol 2016;69:244-9. Shailaja S, Nichelle SM, Shetty AK, Hegde BR. Comparing ease of intubation in obese and lean patients using intubation difficulty scale. Anesth Essays Res 2014;8:168-74. Henderson JJ, Popat MT, Latto IP, Pearce AC, Difficult Airway Society. Difficult airway society guidelines for management of the unanticipated difficult intubation. Anaesthesia 2004;59:675-94. Gonzalez H, Minville V, Delanoue K, Mazerolles M, Concina D, Fourcade O, et al. The importance of increased neck circumference to intubation difficulties in obese patients. Anesth Analg 2008;106:1132-6. Brodsky JB, Lemmens HJ, Brock-Utne JG, Vierra M, Saidman LJ. Morbid obesity and tracheal intubation. Anesth Analg 2002;94:732-6. Riad W, Vaez MN, Raveendran R, Tam AD, Quereshy FA, Chung F, et al. Neck circumference as a predictor of difficult intubation and difficult mask ventilation in morbidly obese patients: A prospective observational study. Eur J Anaesthesiol 2016;33:244-9.